Sign up for Broadjam today to follow American Hit List, and be notified when they upload new stuff or update their news! 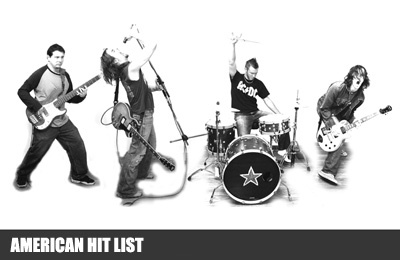 Rock and roll the way it was meant to be, American Hit List pays homage to the music that helped define the rock genre. Influenced by the likes of Led Zeppelin, The Who, Tom Petty, and AC/DC to name a few, they've amassed a repetoire of over 100 originals ranging in style from classic rock and blues to acoustic pop. See them live and you'll never see the same show twice. Guitar and drum solos galore ala Page & Bonham, powerful lighter torching hooks, impromptu songs and undeniably one of the most high-energy (often self-destructive) shows on the West Coast. Hailing from Portland, they've built a dedicated following in Oregon's underground rock circuit, appearing at venues, bars, colleges, parties and busy intersections up & down the West Coast.